GENERAL INFORMATION: This big block classic Mille Miglia Red 1974 Corvette T-top is privately owned and located in NORTH CAROLINA. THE VETTE NET is honored to show you this special-never-restored Corvette. We are a professional Corvette brokerage network and proud Lifetime Business Member of the National Corvette Museum. 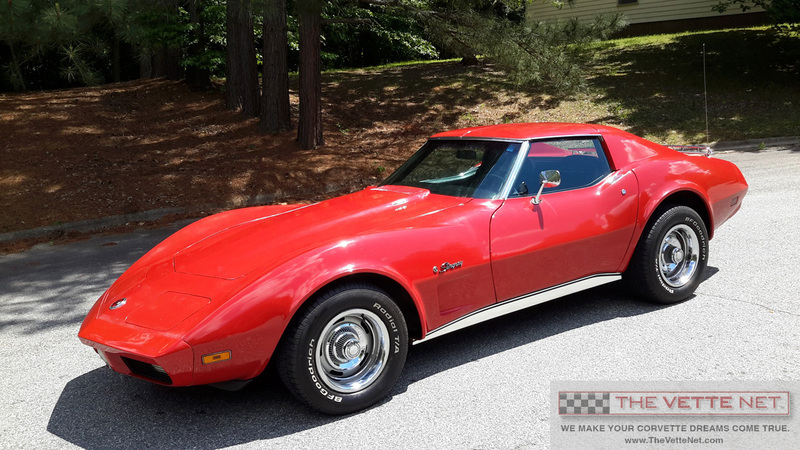 The owner of this “original” numbers matching big block 1974 Corvette T-top has noted the driveline appears to be in factory stock condition and everything works properly. The Millie MIglia Red paint and black leather interior appear factory original and receive lots of compliments. The odometer shows the Vette has been driven only 52,117 miles (documented) since 1974. SPECIFICATIONS/OPTIONS as reported by the owner: This big block Corvette has its numbers matching driveline that appears not to have been modified. You will see the Corvette was ordered with many nice options including: Custom interior with leather seats. Factory AC, Power steering. Power brakes. Power windows. Tilt and Telescopic steering column. AM/FM radio. And the LS4 big block 270 horsepower engine mated to a 3-speed automatic transmission. The BFG Raised White Letter Radial Tires have been driven only 2,000 miles. CONDITION RATING: The owner rates the overall cosmetic condition of his Corvette as #3. Keep in mind this is an “original” big block 1974 Corvette T-top. As you might expect, the Corvette is showing some aging patina but that just adds to its classic status. All the normal maintenance has been done and this Corvette is ready for you to enjoy.